I love asparagus and make as many recipe with it as possible. Right now it’s very inexpensive so I am using it as much as possible. It’s great for you and taste great too. This recipe is delicious. 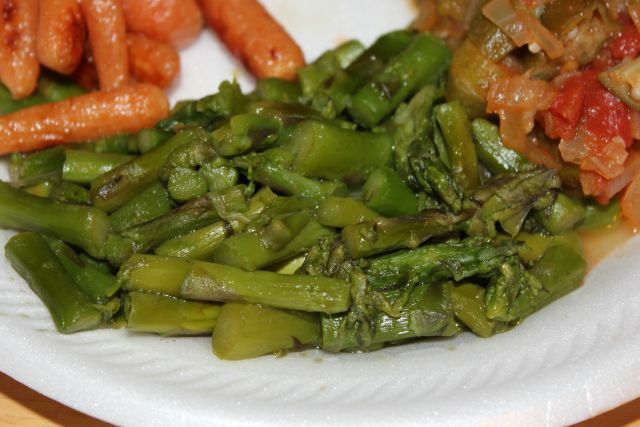 It gives the asparagus an incredible flavor. As the asparagus is cooking it infuses with the beef broth which tastes great. Wash and trim the bottoms of the asparagus stalks Cut each stalk into one inch pieces the woody bottoms should be discarded. Add two cups of beef broth to a skillet and bring to a boil. Reduce heat to medium and add asparagus and steam until asparagus is tender. Most of the liquid should have evaporated if not discard liquid.